How do we decide if an item is a fake or classify it as a reproduction? As far as we are concerned here at the SCIS a fake is any item which has been produced in any way that attempts to mimic or reproduce a piece of Susie Cooper with the sole intention of deceiving the buyer into believing they are purchasing a rare or unusual item and constitutes an attempt to de-fraud the buyer . In these cases more often than not the seller or producer of such an item knows exactly what they are about to do. Unfortunately, on odd occasions some pieces come onto the market which are not intended to deceive, but because of the way they are marketed, they too become a danger to collectors, so for that reason, these too have ended up in our fakes section. A couple of points to bear in mind. It is not always possible for us to post images of fakes we encounter, often if we come across a fake and approach the seller they are not too keen for us to publish their images and because of copyright laws we can not just lift the images and use them anyway - we could end up in trouble for breach of that person's copyright! So all images shown are re-produced with permission of the owners at the time the pictures were taken. We have also decided to include details of some of the toby jugs and figurines made in recent years in the reproductions section. The following list of fakes gives a general idea of the kind of pieces encountered by collectors. New items are added as they are discovered. The biggest recent problem is the emergence of so called miniature t-sets and coffee sets. these originated in the UK during 1997 and have been appearing across the globe. Miniature reproduction coffee pot shown with a genuine small hot water pot and full size coffee pot. Complete sets exist including cups and saucers, side plates cream and sugar, miniature tray. Only known to exist in TIGERLILY pattern on white glaze. Fake factory mark is fuzzy and irregular when compared with the real thing. Made in 1997. Complete sets were sold in a specially printed collectors box. Theappearance of these fakes was reported in the Antiques Trade Gazette on 3rd May 1997. To see this news article click here. These items are NOT children's nursery ware and are NOT 1930's travellers samples. 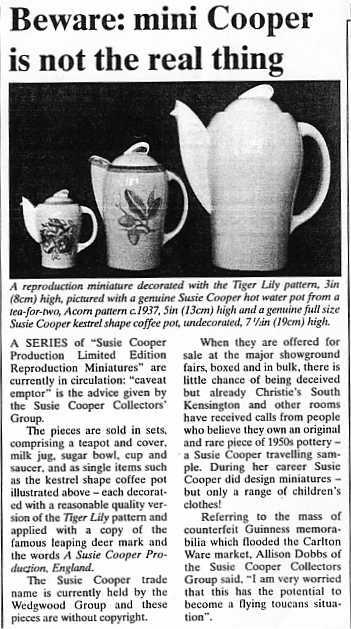 No genuine Susie Cooper miniatures have ever been recorded, with the exception of some small cups and saucers about the size of a child's t-set. Made during her years at Grays Pottery. Moon and Mountain' fakes. I have been in touch with the Clarice Cliff Collectors Club regarding these pieces. An extract from their reply follows. "Hi Mark, nice to hear from you. Your suspicions are, indeed, correct about these pieces being forgeries. We spotted them on Ebay last week and have posted some warning info. on the CCCC site. The pieces are the 'Windsor' shape which was first introduced pre-war and then reintroduced post-war. From the back stamp I would say these are post-war examples, probably late 1940s or early '50s. It is likely that they are decorated in a very simple matt glaze finish underneath. This is not the first time we have seen CC pieces from the 1950s decorated 'after the fact' with earlier 'Deco' style patterns. Please see our fakes information page: http://www.claricecliff.com/fakes/index.htm"
It is fairly clear from the picture that these are intended to represent the 'Moon and Mountain' pattern, though the quality of decoration is somewhat amateur and too thickly applied. A collector has reported sighting a tubelined coffee cup, thought to be Charlotte Rhead, which has had its original factory mark removed and a fake Susie Cooper mark applied. This seems an odd thing to do as Rhead is also collectable, hopefully more details will eventually emerge, for now: no further details available. Several plates have recently appeared with Mabel Lucie Attwell transfers applied to the centre. these transfers are only 'glued' to the surface and can be scratched easily. One version used a Susie banded plate to try and help its cause. Susie Cooper and Lucie Attwell never worked together. Why should they. Susie produced some fantastic nursery ware and Lucie Attwell had a good arrangement with Shelley. Quantities produced unknown. Known shape used: Plates. Faked/Manufactured: post 1995. Sorry no pictures available. The following first appeared as a news article in our November 1999 newsletter. Mabel Lucie Attwell fakes re-appeared at the October Newark International Antique and collectors fair (England) A large Susie Cooper wedding band oval meat plate, pattern 698 was spotted with a hand painted MLA bedroom scene. The centre of the plate was dominated by a young girl in bed, surrounded by green pixies. The illustration was well executed, but the colours used were too pale. Add in the fact that Susie Cooper never produced any nursery ware with Lucie Attwell and you have a blatant fake. The dealer with this piece on display was asking a staggering £300.00 ! Even more worrying, the piece appears to have sold. We have received an email from a concerned Susie Cooper collector informing us that a piece similar to the above description has been offered for sale on Ebay. The Ebay example has a similar scene hand painted in the center except the child is in a birds nest in a tree the plate border is a solid band in grey/green and thin band in pink. Reproduced here by kind permission of Janice Oliver. Please remember Susie Cooper designed her own nursery ware. We can only advise everyone to read the above article carefully! A larger image and close-up images of this MLA plate can be found in our archive where the original article covering these fakes is located. The origin of this pattern is unknown. It has been seen on pieces by other factories including Empire Ware. 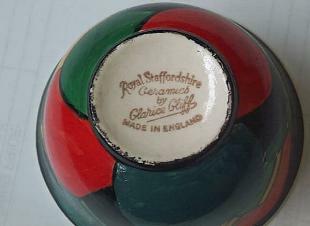 possibly a budget line produced by another pottery in Stoke-on-Trent using other factories Pots as blanks. Quantities produced unknown. Manufactured: 1930s. Not originally intended to deceive. The hot water pot is unmarked and has a clear glaze with hand painted decoration. The T-pot has a Susie script mark. Not clear from the photo is that the words Susie Cooper are crossed out in red. Something done by other factories during the 1920s and 1930s, especially when buying in blank or undecorated ware. First sighted back in March 2001 these plates are usually original pieces of Susie Cooper where the pattern did not include a central design, patterns like banding or exclamation mark as show here, as well as undecorated ware. 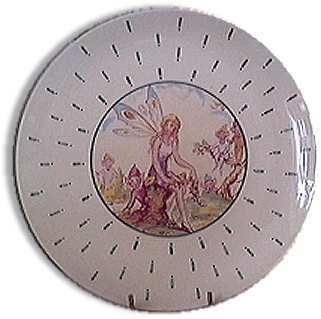 The fairy picture in the centre is a modern transfer which is applied to the top surface and as a result can easily be scratched with a sharp object. These items are no longer genuine Susie Cooper but pieces of her work which have been doctored to make them appeal to collectors, they were made solely to deceive and as such should be condemned as fakes. All pieces have various Susie Cooper factory marks. Honey pots with moulded bees never previously seen by three top collectors who have all been collecting for over ten years. No contemporary records reference this shape. Figurines only a few genuine examples know and all well documented in various Susie Cooper books. Advertising ware only one previously recorded large plate with the words "Susie Cooper Pottery" hand painted around the rim, no other 1930s shop display or similar type seen or referenced. Teapots Susie was using three main tea ware shapes all designed by herself at this time in her career, Kestrel, Rex and Falcon. There are a few other teapot shapes used and again all are well documented in books about Susie Cooper. As always, we strongly recommend you contact eBay sellers and obtain written assurances (an email should be good enough) regarding the authenticity of an item and details of their refunds policy should you not be happy with your purchase.